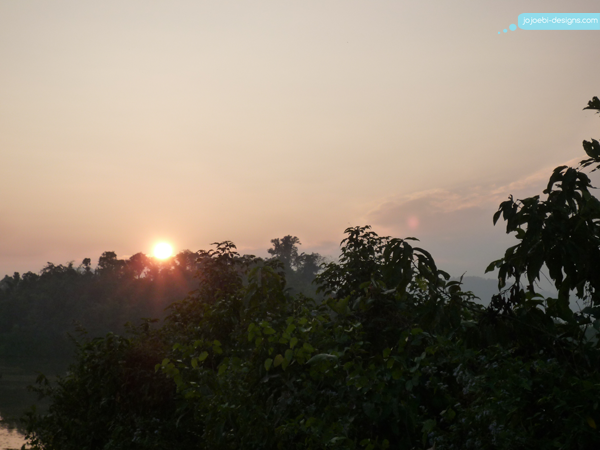 jojoebi designs: The Elephant Conservation Centre, Laos! 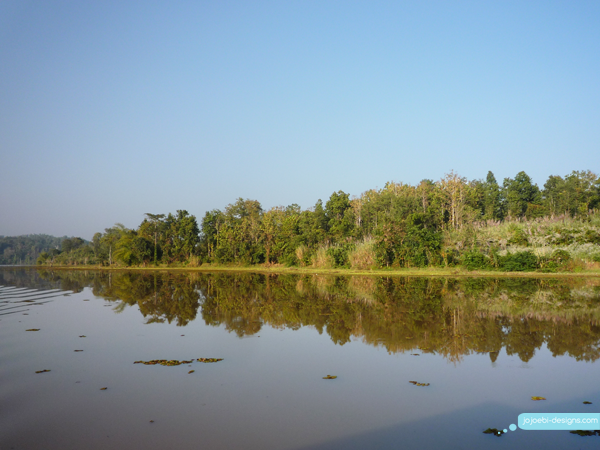 The Elephant Conservation Centre, Laos! 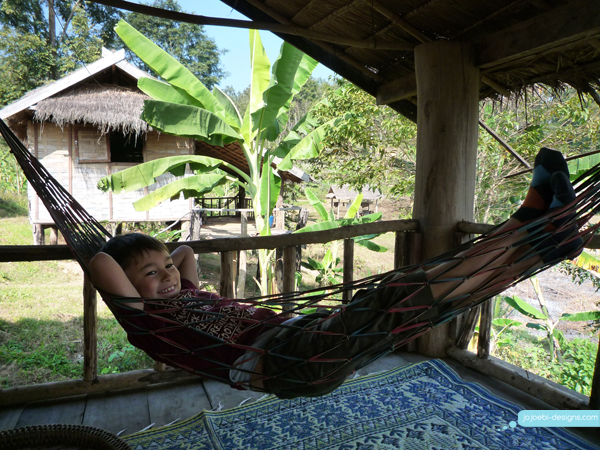 The main highlight of going to Laos was knowing we were booked in to visit the Elephant Conservation Centre, (ECC) I actually booked us in BEFORE we had booked flights and Yasutoki had booked the time off work! As you can imagine, when Ebi-kun got sick we were all gutted that we were going to have to cancel but… the lovely folk at the centre emailed me back and said they could squeeze us in! Hurrah. Again, we set our alarm clocks to get up early so we could be at the bus station for about 7.30am, the bus isn't scheduled to go until 9am but once it has filled up, it leaves. This is great if you want to get somewhere early, not so much if you want to leave at 9.00am. Anyway, it was true Faulty Towers type comedy to start the day, we managed to get breakfast and leave the hotel at 7am, the tuktuk took us just around the corner then stopped. The driver excused himself and disappeared talking on his phone. Eventually he came back and explained that he had run out of petrol. Aggghhhhh. Then one of the guys from the hotel turned up his motorbike to tell us that another guy was on the way with the petrol. We were worried about missing the bus, so Yasutoki got on the back of the motorbike and went to the bus station ahead of us to get the tickets. Ebi-kun and I just had to sit and wait. We finally got to the station and Yasutoki told us that it was no problem, the guy from the hotel had shown him which bus it was an no-one was getting on it. By 8.30am I was growing suspicious that no-one was getting on the bus, so we double checked with the station staff only to find out that it was completely the wrong bus! Ours was almost full, it was lucky we checked. It was truly a locals bus with only one other foreigner on there. Old, half the windows wouldn't shut or open properly and everything plus the kitchen sink was been lugged onto the roof, including a motorbike! Seat tickets included a plastic stool in the aisle for those late comers. We set off on a very dusty three and a half hour journey. We stopped for a toilet break and I am kicking myself for not taking a photo but hoards of women surrounded the bus, selling snacks and drinks, most fruit and drinks but one woman had two rat like creatures, still alive and held by the tail, heaven knows what we were supposed to do with them! Amusing stories aside, we eventually made it to Sayaboury bus station where we were met by a tuktuk driver from the sanctuary and discovered that the other foreigner was also headed there, the lovely Juliette from France. 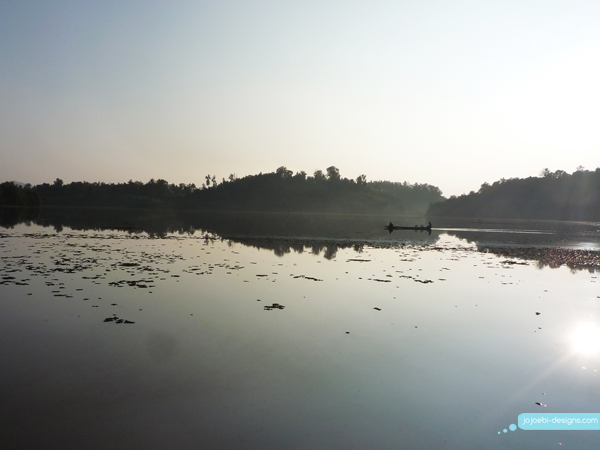 It took us a 20 minute ride to get to the lake and then we were collected by a boat and taken to the sanctuary. At 2pm we had to meet our guide, Ken. He was great, told us about the sanctuary, how the money from our stay was distributed and how the aim of the sanctuary it to help the mahout and their families as much as it is to help the elephants themselves. 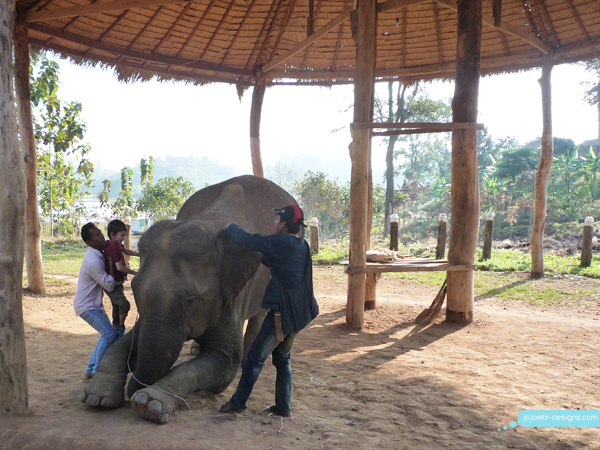 ECC has the only elephant hospital in Laos and the vets also go out on a regular basis and do check ups on elephants that are used for logging. 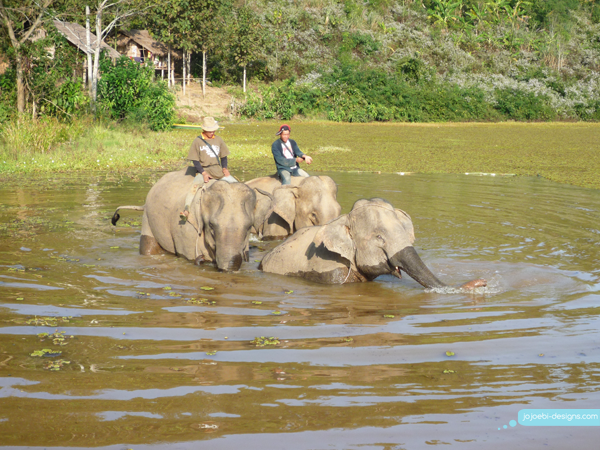 Their main goal is for the care of the elephants and to increase the population of the Laos Asian elephants. After all that it was time for our first riding lesson. 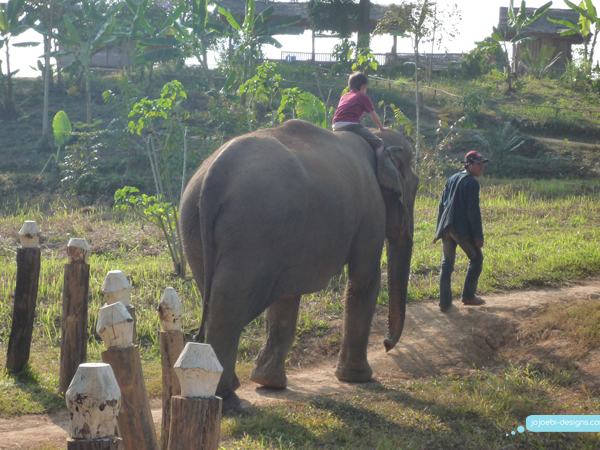 We were introduced to three of the elephants, this is Mae Dok, she is kind and slow. She was born in 1963 and was used extensively in the logging industry until she came to the centre. Because of her gentle nature, she became "Ebi-kun's Elephant", this is the one he rode each time. 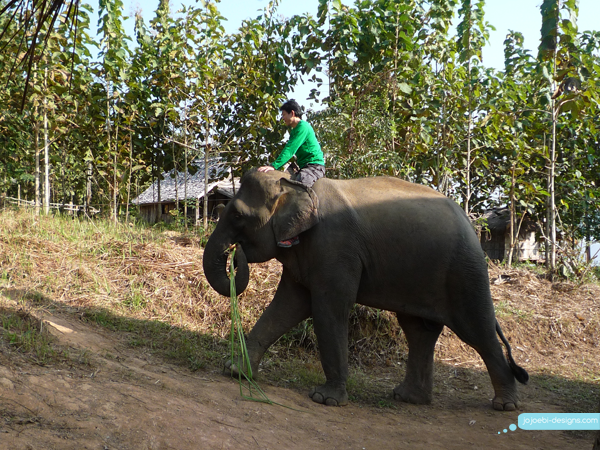 When it came to riding, I was expecting them to have Ebi-kun get on with the mahout but before I knew it, he was on the elephant and headed off for a walk around the village! One of the important things that were learnt was that the chairs that are used for carry people and luggage on an elephants back (hawdah) really isn't good for them. This is due to the shape of the bones, they had a skeleton in the hospital but you can see here if you are interested. It is more comfortable for the elephant to be ridden without any kind of saddle and sat on their neck. Something i didn't know and we will be sure not to ride with a howdah in the future. 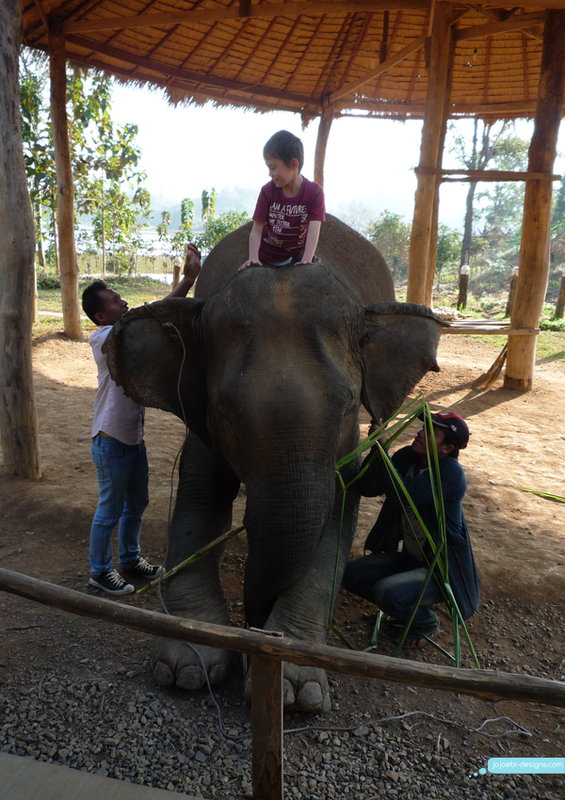 I also got to ride Mae Dok, bit of a nightmare trying to get my short legs up and over, it's not like getting on a horse! We wee all surprised at how hairy the elephant's head it is. Next was Yasutoki's turn. 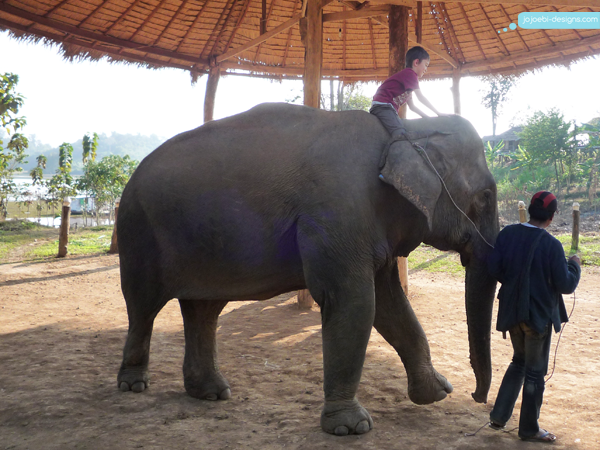 He got to ride Mae Kham Ohn, she is the oldest of the elephants at 71 or 72 and also the biggest. She has lots of personality including not liking small animals, she had been known to take a swing of her trunk at chickens who come too close and she is not a big fan of small children either. After we all had a ride, it was bath time. 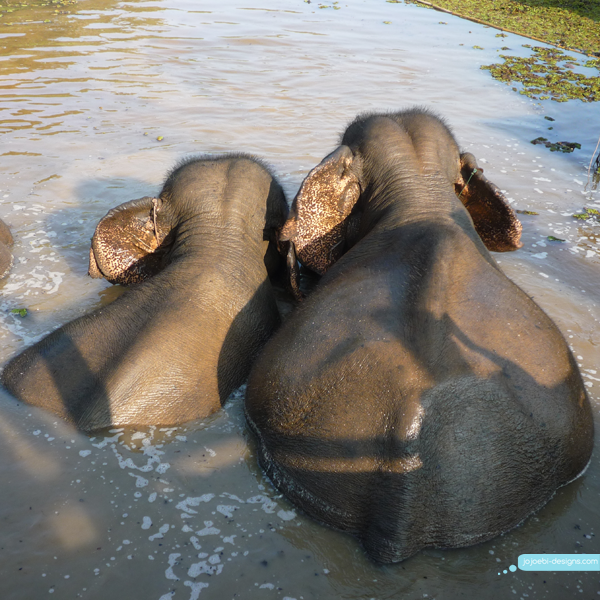 Only the mahouts are allowed in with the elephants, this is because Mae Kham Ohn LOVES her bath time and gets a bit over excited sometimes. 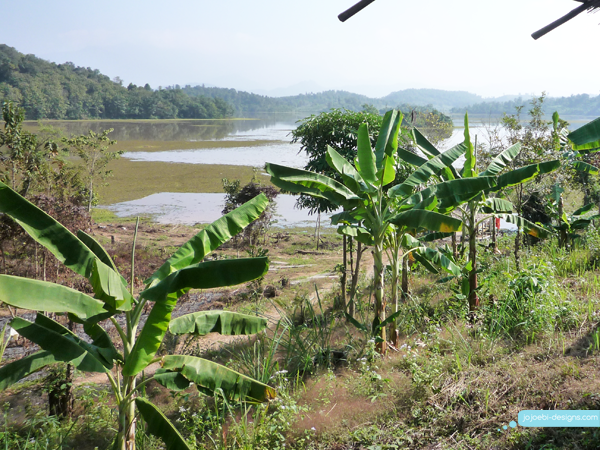 The third elephant here is Mae Boun Nam, she is young and luckily for her, never used for logging. 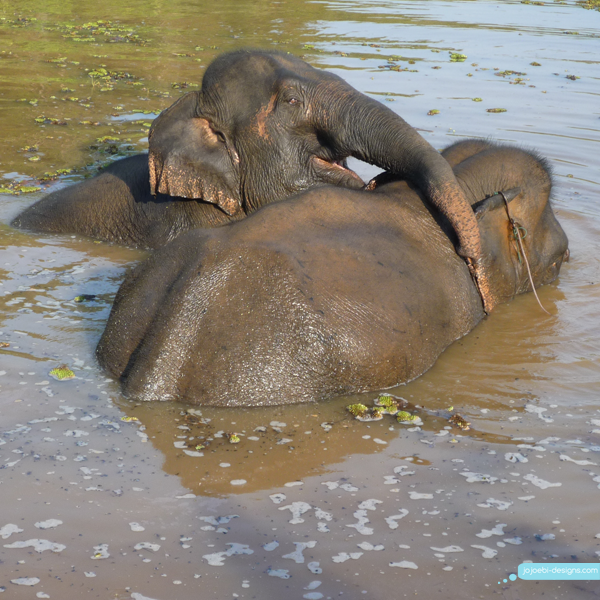 Is there anything cuter than elephants in the bath? 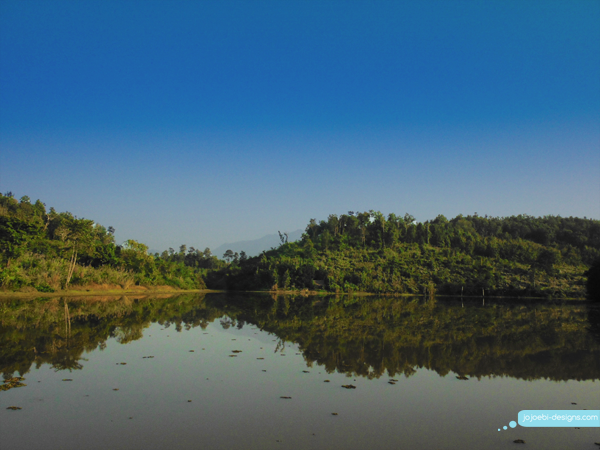 It is actually a reservoir and was built to help with agriculture in the area because ether lacked water for farming. It was extremely peaceful except for the chug-chug of the boat engine. After the boat we had a little time to hang out before dinner, just watch the sun go down and relax in our surroundings. Dinner was served in the restaurant around a big table, everyone together. It was fun meeting all the others who were visiting, such a diverse selection of people. The food was simple but easy and washed down well with a beer or two. It was an early night for us, it had been a long day!